Recipes resemble tunes in that they are easy to plagiarize without realizing it. 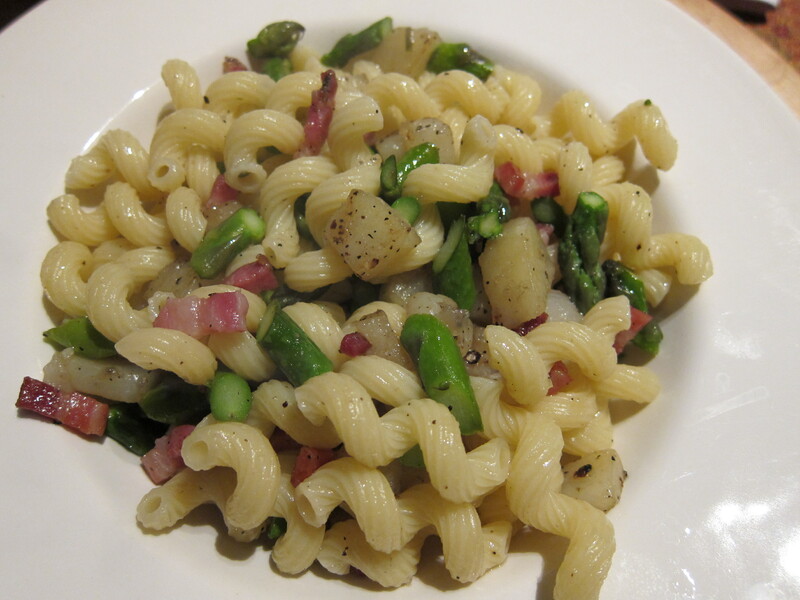 Who knows if I once read somewhere that asparagus, pancetta, and potato together make a delicious three-part harmony? Maybe I did, maybe I didn’t. But standing in front of my refrigerator last night, I saw that I had a little of all three. Pasta and potatoes together seems counter-intuitive. Two starches in one dish equals too many starches in one dish. But something made me want to experiment. The key, I realized, is not too much of either. The pancetta’s fat enhanced the crispness of the outside and the floury inside of the fried potatoes. Both complemented the subtle taste of asparagus and the texture of the pasta. The keys to the success of this dish depend on achieving a balance among the ingredients and using pasta — saucer-like orrechiette would work– that cup the bits of asparagus, pancetta and potato. I had on hand only cavatappi, which did not make it easy to pick up the ingredients. Put a big pot of salted water on the stove to boil. While the water is coming to a boil, slice the pancetta. Then cut the small potato in half and cut it into small cubes. Dispose of the remainder of the potato. Then cut the asparagus spears on the diagonal into about 1/2 inch thick slices. Shortly before the water comes to a boil, start heating the olive oil in a 10- or 12-inch skillet. Put in the pancetta and let them begin to sizzle and release their fat before adding the potatoes. Make sure all the pancetta pieces and potato cubes cover the bottom of the skillet in a single layer. Leave them to crisp and brown on their edges, which means leaving them along without stirring as much as possible without letting them burn. Meanwhile, cook the pasta in the salted water. Set a timer for 2 minutes short of the recommended length of time for the pasta. When the timer rings, add the sliced asparagus to the pasta water. As soon as the pasta is finished, drain the pasta (save half a cup in case the pasta sauce is too dry) and the asparagus and before shaking off all the pasta water, quickly tip them into the skillet. Turn the heat up, stir the contents of the skillet for a minute or two, add the reserved pasta water if you want, and then pour into a pasta bowl. Drizzle with a little bit of extra-virgin olive oil. Skip the parmesan. Eat right away.